Lean Luxury means lots and lots of extra lean proteins and some of the best ways to add this to your day to day meals is by adding juicy tender poached chicken. 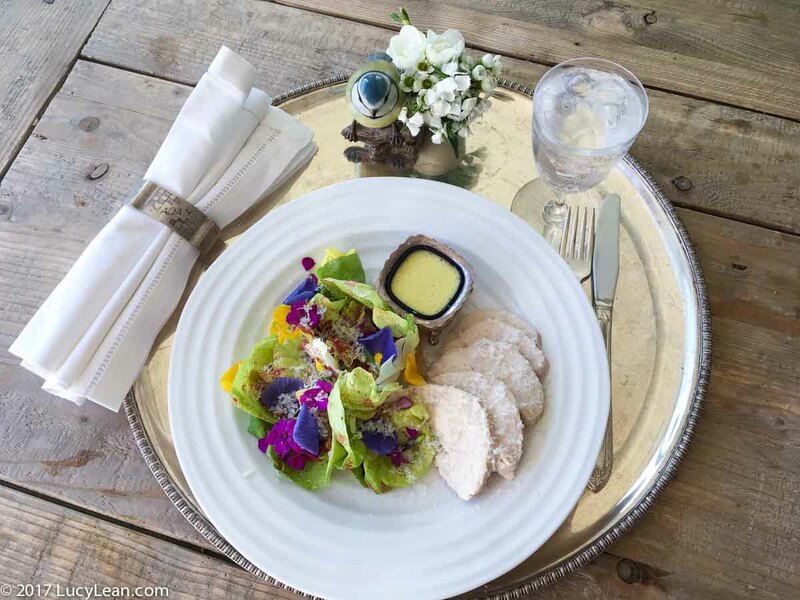 It’s great to boost the protein in a salad – like I did with the Spring Caesar Salad. It can be shredded for a Puck Chinese Chicken Salad and it can also be sliced for sandwiches. Think of it as a basic in your Lean Luxury preparation to succeed. It’s always good to have some chicken breast on hand – it’s low in calories and fat and high in protein. Plus it’s extremely versatile and shouldn’t be rubbery and bland but juicy and delicious. Remove the skin from the chicken breasts if they have. In a large pot place the chicken breasts with the aromatics (I used carrot, celery, thyme, garlic, peppercorns, red chili pepper, Jamaican all-spice). 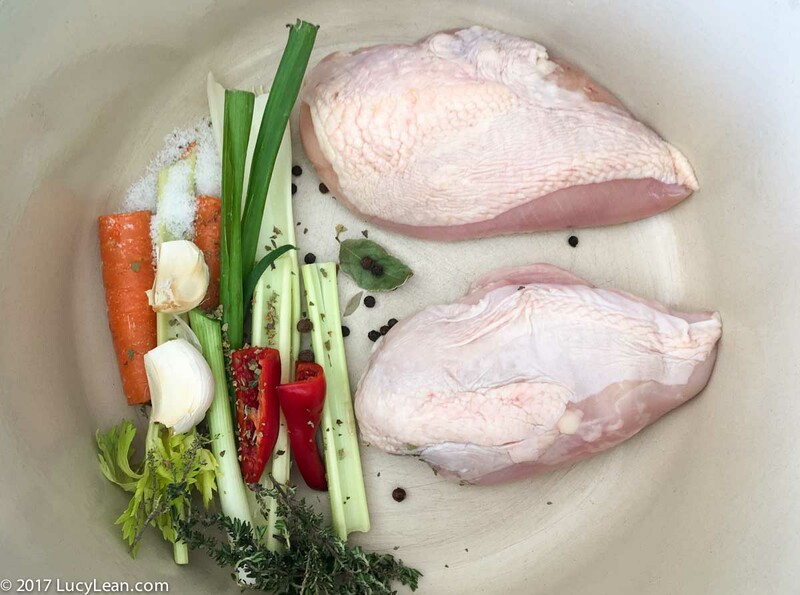 Add water – enough to cover the chicken by about an inch. 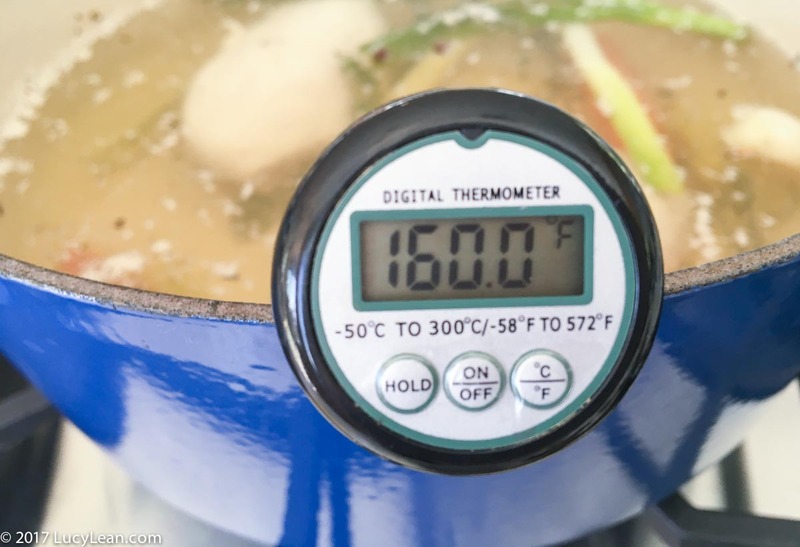 Add salt and then and heat on medium high until temperature reaches 160°F on an instant-read thermometer. As the chicken cooks adjust heat to maintain water temperature in the 150–160°F range. Make sure the temperature stays above 150 and below 170°F.) Cook until thickest part of chicken registers 150°F on an instant-read thermometer, just over 1 hour. 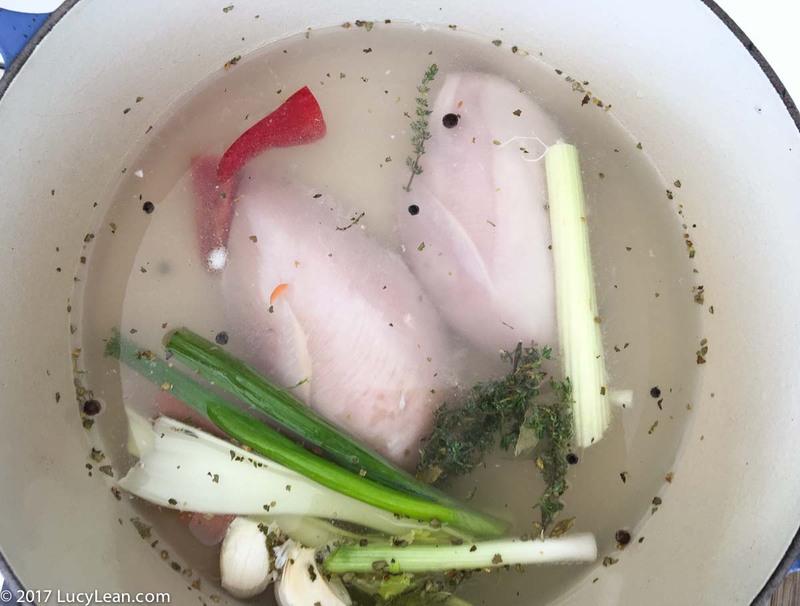 Remove poached chicken from broth and let rest. Strain broth through a fine-mesh strainer and save for sipping, cooking veggies, or a stock for making soup.